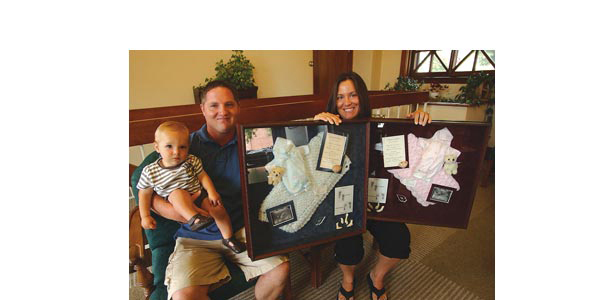 Nick and Melanie LaCanne of Faribault hold their treasured memory boxes Wednesday of the twins they lost in March 2006. Releasing butterflies last summer at the annual Infants Remembered In Silence benefit golf tournament helped ease the sorrow for Nick and Melanie LaCanne over the loss of their twins. "It was very moving to see the butterflies take flight," said Nick LaCanne, a Faribault resident who works for his parents and their LaCanne's Marine business. This year Nick will be doing it again, but Melanie, an emergency room nurse at District One Hospital, will have to work and miss the 5:30 p.m. memorial butterfly release on Friday, July 11. "People can give a donation and release a butterfly in memory of anyone who has died, and we want people to be aware that the release is opened to the public and not just IRIS members," said Diana Sundwall, founder and director of IRIS, an organization dedicated to supporting families who lose a child in pregnancy, early infancy or early childhood. The LaCanne's have overwhelming gratitude toward Sundwall, who went to Abbott Northwestern Hospital on March 21, 2006, the day Melanie delivered their twins, Chase Douglas and Finley Rae. The babies were stillborn. "Diana being there meant I had memories of the twins that we never would have had otherwise," Melanie LaCanne said. Melanie first met Sundwall when she was working as a nurse in District One's Women's Health Unit. She learned how IRIS and Sundwall and other volunteers from the organization come to the hospital to help those suffering. So when at 22 weeks into her pregnancy, she suddenly found herself with a bad infection and delivering the twins early, she wanted Sundwall to be there along with her husband, Nick. Sundwall rushed up to Abbott. She herself experienced a stillborn delivery of her son, Derek, and it was because of her own experience with such a crushing loss that she started IRIS in 1987. "What I did and what I always do when I help couples who've lost a child is to slow things down so that Melanie and Nick could have some memories of their twins," Sundwall said. She talked the nurses into letting her help Melanie give the stillborn babies a bath. After they were dried, the two put outfits Sundwall brought on the babies and covered them with blankets. Nick and Melanie held the twins. Sundwall took pictures on her camera, and she made clay castings of the babies' hands and feet. The LaCannes put those items into two remembrance boxes for Chase and Finley. "It was such a hard loss after working to get pregnant for five years and suffering several miscarriages along the way," she said. "I'd worried so much during the pregnancy, but at that stage in the twins' pregnancy, I had stopped worrying and expected things would be OK."
When people ask how many children she has, Melanie says "three. Two are in heaven, and then there is Darby." Darby is their 14-month-old son who is at the stage where he is not too different from a butterfly, fluttering here and there, and moving quickly. They need all their energy to keep up with him. "We're just so grateful for IRIS," Melanie LaCanne said. "That's why we support benefits for it like the golf tournament and butterfly release." â€” Staff writer Pauline Schreiber may be reached at 333-3127.